Adventuring with toddlers: Camping with young kids? Try it! As I previously mentioned (multiple times!) I love camping with my (toddler) girls. But I admit, it’s an intimidating thought at first. This post is mainly trying to convince you to go camping with young kids, because it probably won’t be as bad as you think it’s going to be. Trust me, if I can do it, you can do it. Fear: My kids will never sleep in a tent. Ever. We will all be sleep deprived messes and no one will have any fun. Reality: OK, it’s true that your kids may not sleep well while camping. BUT, my kids may possibly be some of the worst sleepers ever (at home), and they do much better in a tent. Out of the six families we went camping with, most of us had at least some trouble getting our kids to fall asleep, but usually cuddling them to sleep does the trick! Of course, this process can take an hour (or more!) but it eventually works. Also, bedtime may be pushed back wayyyy later. In Washington it doesn’t get dark until around 9:30pm at this time of year, so 7pm bedtimes definitely weren’t happening among our group. The positive aspect, once the kids fell asleep, they generally stayed asleep! We did have to put Isabelle into our bed every night (because I think she got cold in the middle of the night) but she slept until a decent hour after that, so we couldn’t really complain. Reality: Packing for camping is a lot of work in general, and it’s definitely way more work with toddlers. Basically, just pack a ton of snacks, some warm weather layers, and bug spray, and you should be good to go! Of course, sand toys help, because then the toddlers can play in the dirt wherever you are and should be pretty happy. We also brought toddler bikes and balls and bubbles… you know, all of the essentials. *wink* Basically, it does take a lot of prep work, but you will be fine! Reality: They’ll be cold if you don’t put them in layers! I recommend packing a sleeping bag (or blankets), pillows, footie pajamas (or fleece), wool base layers (for older kids), hats, and socks. Honestly, my kids wore their normal pajamas and slept with normal blankets, but it wasn’t very cold where we were. When all else fails, move the kiddos into your bed and everyone can cuddle together! Fear: My kids will get dirty. Reality: YES. They will! And if that bothers you, I suggest finding a campsite that has running water so you can give them a shower. Or better yet, bring a bin you can fill up with water and give them a camp-style bath. Fear: It sounds like a lot of work to watch the kids, cook meals, clean up meals, set-up camp… etc. Reality: It really is a lot of work! It helps to go with friends, family, or a super helpful partner. It’s especially difficult when there’s a fire going and you’re trying to keep your toddlers out of it! Last year my girls wanted to throw things in the fire at any given moment and that was less than ideal. However, if one person can watch the kid(s) while the other does the more ‘campy’ stuff, then you can switch after a while. 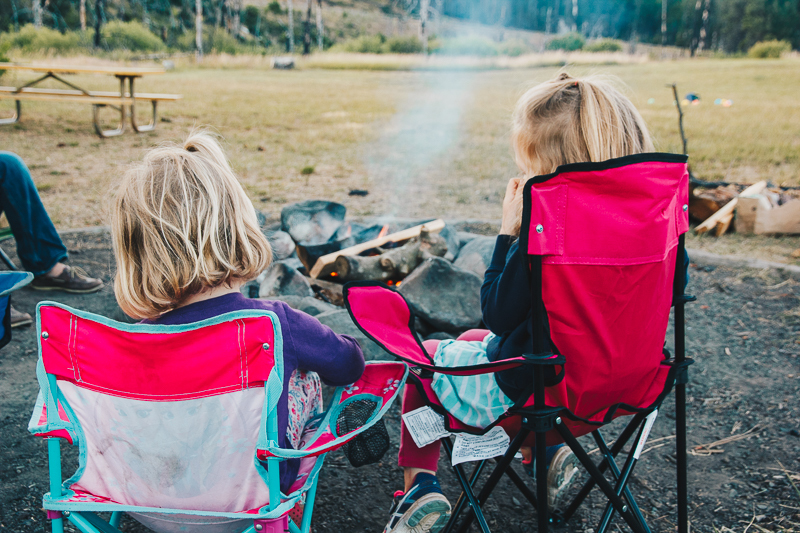 If you’re going camping with just your immediate family, it can definitely feel like you never have time to relax if you’re at the campsite… so I recommend making sure you leave and go on outings! Hike, swim, explore, go into town, etc! Fear: I’ve never been camping before and the gear is so expensive… what if we hate it and only go once? OK, that’s all I can think of right now! Basically, a lot of your fears may become reality, but it’s still worth it to go on camp trips and create memories with your little adventurers. I was pretty intimidated initially, but last year I loved it so much that we bought all of our own camp gear (we had been borrowing other people’s), and this year I made reservations in advance so we can go camping a few times over the summer! I can’t wait! My girls truly love sleeping in tents and roasting s’mores and swimming in lakes and every other thing that camping entails. If you’re pondering whether you should go camping with young kids, I highly, highly recommend you give it a shot! This entry was posted in adventuring and tagged adventuring, camping, toddlers. Bookmark the permalink. 4 Responses to Adventuring with toddlers: Camping with young kids? Try it! I absolutely want to do this with Jack!! He’ll LOVE IT! We all have such fun memories already! I’m REALLY late in responding but I will say this past weekend we went camping at a campground without showers and there wasn’t a lake nearby and my girls got FILTHY. I definitely prefer to camp near a lake for a quick clean-off!